KANSAS CITY — The postseason is the land of small sample sizes, where lasting judgments are often made with minimal data. A bad outing for a pitcher that would be filed and forgotten in June is taken as a possible sign of folding under pressure in October. If a hitter goes through a bad stretch in the regular season he’s just in a slump, but if he does it in the playoffs, the whispers start: Could it be that he can’t handle the big stage? Most of this is nonsense, of course, because baseball is a game that should be assessed in big gulps, not small bites. Occasionally someone reminds us of that, as when Dodgers pitcher Clayton Kershaw, who hadn’t had nearly the postseason success that one would expect of a pitcher with three Cy Young Awards, shut down the Mets for seven innings in their playoff series last week in an elimination game for the Dodgers. Suddenly it seemed so silly, this idea that players who perform at a high level for six months suddenly get the yips in the cauldron of October. For six innings on Saturday, it appeared that Blue Jays starter David Price, another Cy Young winner with a similarly poor postseason history, was going to duplicate Kershaw’s accomplishment, if not exceed it. Price was nearly flawless against the Kansas City Royals in Game 2 of their American League Championship Series, allowing a leadoff hit to Alcides Escobar before retiring the next 18 consecutive batters. But in the seventh, whatever postseason gremlins have dogged Price in the past got to him again. Also, the Royals are very good. Trailing 3–0, they pieced together a five-run seventh that began with a botched pop-up in rightfield, on their way to a 6–3 victory that gave them a 2–0 series lead and left the Jays, particularly Price, once again shaking their heads. Afterwards, Price was asked if it was frustrating to pitch so well, then suddenly struggle. Struggle or not, the outing ended up being another in a series of postseason disappointments for Price. He has now been the losing pitcher in all seven of his career postseason starts and owns a 5.24 ERA. After pitching splendidly for Toronto after he was acquired from Detroit at the trade deadline, he has a 6.75 ERA in two starts and a three-inning relief appearance for the Jays in the playoffs. ​Goins was more forthcoming. 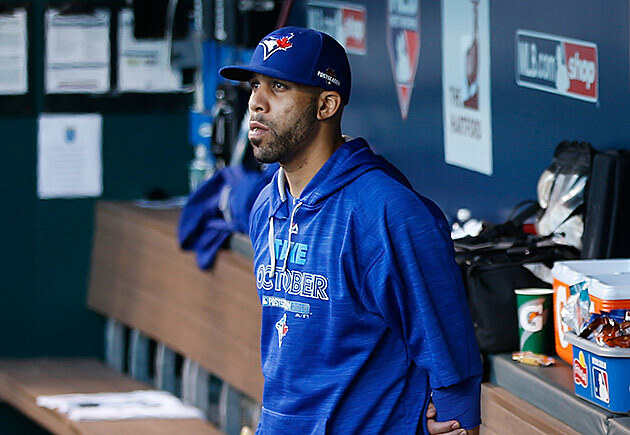 In a show of accountability, he made himself immediately available as soon as the media was allowed into the Blue Jays’ clubhouse. “It’s on me,” he said, going on to explain that he called for the ball as it floated toward the foul line in short rightfield but at the last moment he thought he heard Bautista coming and he pulled up. But Price didn’t hold either of his teammates responsible. The normally gregarious Price wasn’t much interested in trying to explain his postseason problems, though. ​It worked out perfectly for the Royals, who, in case it wasn’t clear by now, are a resilient team, awfully good at taking a small crack and turning it into a gaping hole. They did it in the seventh inning of the deciding game of the division series against Houston, when Astros shortstop Carlos Correa’s error opened the door to their decisive five-run inning. They did it again after the gaffe between Bautista and Goins. Singles by Lorenzo Cain, Eric Hosmer and Mike Moustakas produced three runs, and Gordon drove a Price fastball in the gap in right center—“the one pitch I’d like to have back,” Price said—to give the Royals the lead for good. Or maybe it’s just that the Royals got what they deserved. Kansas City’s offense is opportunistic and loaded. The story of the comeback may have been more about the Royals’ strengths than Price’s failings, but that won’t change the narrative about Price being a different pitcher in the postseason. Stories don’t matter much more than sample sizes. If he wondered how things might have been different if that pop fly had been caught, Price wasn’t admitting it. But he did gaze blankly into the outfield after it happened.